The 2019 Annual AACTS Conference will be held in Lithonia, Georgia (outside of Atlanta), from Wed., March 13th through Fri., March 15th. 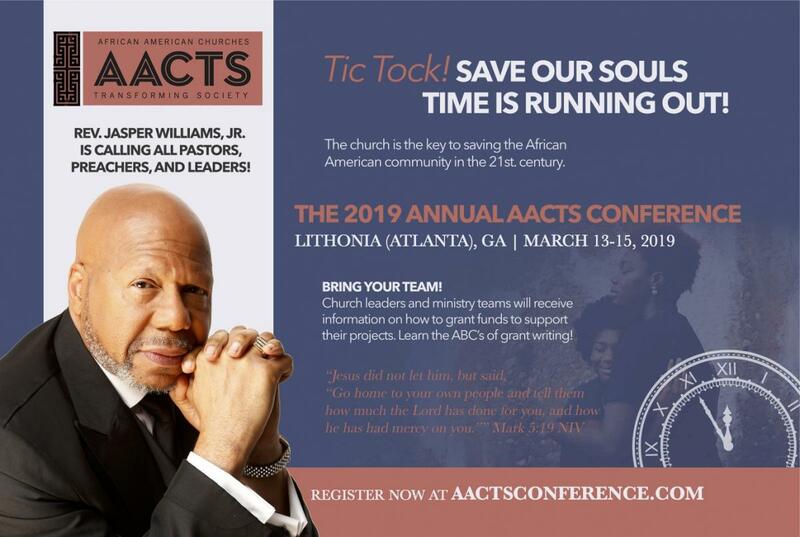 The 2019 Annual AACTS Conference will be held in Lithonia, Georgia (outside of Atlanta), from Wed., March 13th through Fri., March 15th. With the theme Tic Tock! S.O.S. : SAVE OUR SOULS TIME IS RUNNING OUT, Rev. Jasper Williams will convene church leaders and leadership teams during an action-driven, three day, conference. During the conference church leaders and ministry teams will receive information on things such as: how to find funding for prevention programs as well as how to get the right partners to the table and how to prepare your congregation for greater impact in the community. Presented by African American Churches Transforming Society (AACTS). AACTS is a collective of African American Churches working together to develop and expand initiatives, services, processes, programs and resources to help our communities and people thrive and prosper.